I am satisfied with the quality of security and stability. It is also helpful to be able to purchase in a two-pack. This review is about item#76149263. Purchased at the foot of other things. There is no problem with quality because MAX. The price is reasonable. This review is about item#76149272. There is no problem because it is a product that has been used for many decades. This review is about item#659312. Most things will be bound if you use Max's needle. We used cheap product of other makers, but when we think about spelling again It is better to use this needle. Price is more important than anything of standard items. The needle of a hundred yen shop is weak and the material is weak and it will be bent ... only it will be garbage if you buy it a lot. So it is no good not to buy such things that have a solid quality. This review is about item#6419795. We bind staples and daily reports with staples so we use staples in large quantities. It is very helpful to buy them all in this way. Because it is a classic Max staple, it is not something bad. It is a product with high cost performance. If you buy it at the stationery shop, it is better for monotarou. This review is about item#00659312. 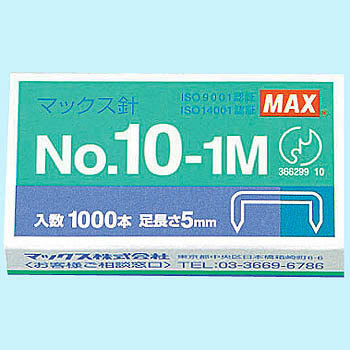 Because we staple inspection results etc., we use stapler in large quantity. So you can buy them all together. This review is about item#06419795.